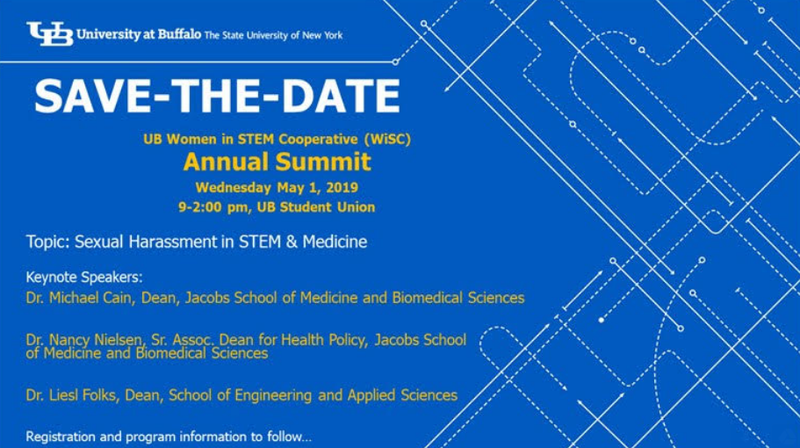 Please save the date for the UB Women in STEM Cooperative (WiSC) Annual Summit, May 1, 2019, 9:30 – 2pm in the UB Student Union. The Summit will feature a thoughtful discussion on sexual harassment in STEM & medicine, as well as a hands on workshop for faculty, staff and students interested in campus resources, information on reporting mechanisms and strategies to deal with unwanted behaviors. See the graphic below for additional speakers and stay tuned for registration information.